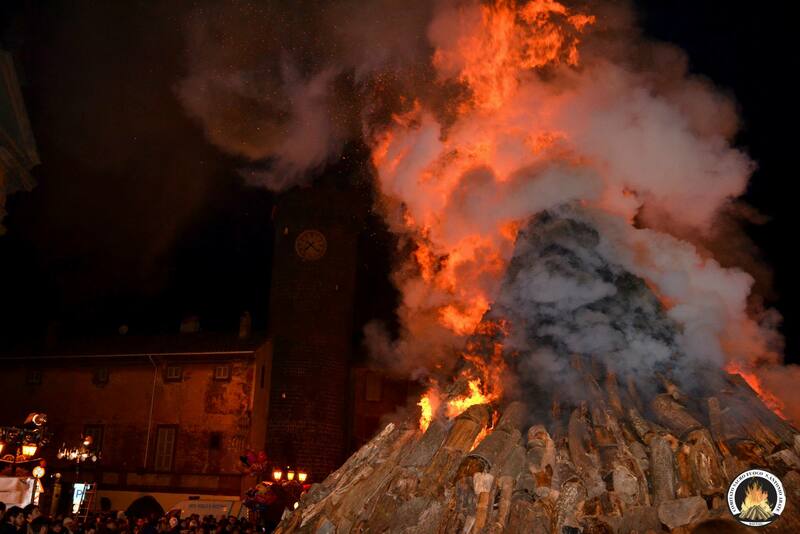 The so called "Fuoco di Sant Antonio" is a typical manifestation that the local community of a small village called Bagnaia, are used to celebrate in the evening of each 16th of January in honor of the Saint. 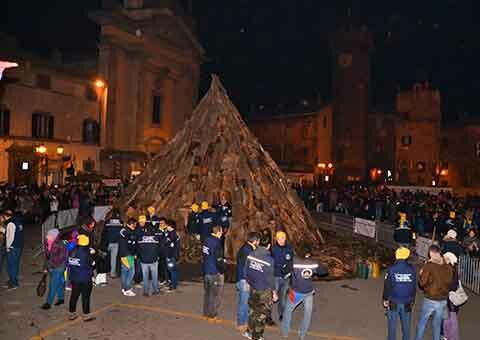 The bonfire is eight meters tall and thirty meters wide, and it is one of the biggest bonfires in Italy. According to the tradition Antonio was considered the patron saint of fire. Rituals around him show an important relationship with the pre-Christian cultures where fire was thought as an auspicious element. The significance of this tradition is to unleash the positive forces and defeat the evils and diseases due to the fire. This festival is organized by a group of about 60 persons who work very hard throughout the year to give to their village a moment of folklore, tradition, enjoyment and especially to give thanks to the Saint. 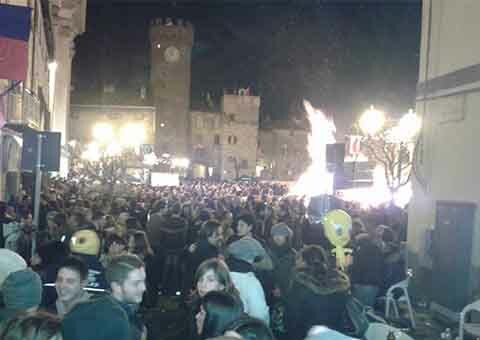 During the feast the bonfire burns in the middle of the Square and all around it people have fun with music, dancing, singing, and tasting the local produce especially the local sausages and wines. A strange fact of the festival is that the wood used on the bonfire is collected by the man of the country each week-end during all the year. Every year the pile of wood has become bigger and bigger. Meanwhile the women of the village prepare food for the boys but they also provide to the organization of the historical procession. The procession passes through the streets of the village before the bonfire is lit. The day after bonfire, is organized the blessing of the animals and to all the visitors is offered a cup of hot chocolate with typical Bagnaia's cakes prepared from the ladies of the country. This festival started after the First World War and is a great tradition regarding the four different districts in which the village is divided during the festival. These four districts are called “Castello”, “Villa”, “Pian di Quercia” and “San Marco”. During the days of the festival the local children parade around in their district’s colours. The clothes are sewn by their mothers and grandmothers. Initially for each district there was a jockey and a grabs was organized. Nowadays for safety and organizational problems the grabs has been replaced by local popular games and each district participate in the games. The most popular games are “catch the hen” and “sack race”. Now all the inhabitants of Bagnaia are getting ready to celebrate their festival. The countdown has begun.